Spokane architect Benjamin Karl Ruehl was born June 22, 1899 in Reedsburg, Wisconsin but came to Spokane as an infant and attended grade school and high school in the city. Drafted during WWI, Ruehl became a Navy instructor at the University of Washington (1918). Then after the war he enrolled at Washington State College in Pullman (1919-1921). 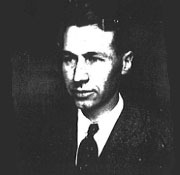 For reasons unknown, Ruehl transferred to the University of Michigan in 1922 and graduated there with a Bachelor’s degree in architecture in 1923. Upon graduation, Ruehl moved back home, and became a draftsman for Spokane architectural firm of Whitehouse & Price (1924-25). While there he worked on the East Valley High School project and the Inland American Printing Company Store. He then moved back to the mid-west and took a job with the noted architectural firm of Smith, Hinchman & Grylls in Detroit (1925-29), rising to the level of job captain. Further experience was gained by working for the firm Giffels & Vallet (1929-1932) also in Detroit. While in Michigan he acquired his architectural license (1928). During the Depression years, work became scarce, and Ruehl was laid off. In 1932 he took a job with the Bureau of Reclamation and became the townsite architect for the government engineers camp at Grand Coulee Dam (1932-1935). It was during this time that he acquired his Washington State architectural license by reciprocity in 1933 (No. TL 178). With 10+ years of practical experience, in 1935 Ruehl started his own independent firm. His first recorded design during this phase of his career was a modest home at N 1718 Nomandie St.. Built in 1936, the local press referred to the home as “French Colonial” but the house is actually a modest WWII era cottage. His other early projects include the Dr. Charles Anderson House (1940, S 2605 Jefferson) described as a “Connecticut Farmhouse”; and the Dr. Fred Harvey House (1940, E 720 27th), a quant French Eclectic Cottage. During the war years Ruehl teamed up with his former employer, Whitehouse & Price, to work on buildings at Farragut Naval Training Station on Lake Pend Oreille in Idaho. He returned to private practice in 1945 and embraced the new design aesthetics of the day such as the Streamline Modern and International styles. Notable projects after the war included the J. Poulin Co. Store (1945); Old National Bank – Garland Branch (1950); the W.T. Grant Company Store (1953, with L.A. designer Nelson P. Rice) the City of Cheney City Hall - Light Department Building (1951/1969); and Wilbur City Hall (1957). Ruehl specialized in educational facilities and toured schools on the east coast to learn about new designs and there potential application here in the west. His school projects in Spokane included portable classrooms at Madison School (1945); the rebuilding of Webster School (1947); an addition to Jefferson School (1949); and Madison Elementary School (1950). Outside the city he designed Garfield County Elementary School (1955) in Pomeroy; an elementary school (1951) in Reardan; East Lena Whitmore Elementary School (1952) in Moscow, ID; Borah Elementary School (1952) in Coeur d’Alene; and Coeur d’Alene High School (1953). Ruehl was a frequent lecturer and commentator. Newspaper reports indicate that he spoke at several city council meetings on topics that would have the potential to affect the downtown and commented on proposed building code changes. He served as the Spokane AIA Chapter President (1951-52); and President of the Associated Engineers of Spokane. On the social side he was a member of the York Masonic Lodge No. 234 and the Theta Xi fraternity. Ruehl ended his active practice in the late 1960s but maintained his office in the Old National Bank Building – Garland Branch until 1985. He passed away in Spokane on April 17, 1987 at the age of 87. His son, Gordon (1934-2012) also became an architect. “Rites Pending for B.K. Ruehl, Noted Architect” Spokesman Review: April 18, 1987. “Finch School Bids Postponed” Spokesman Review: August 24, 1945. “Spokane Firm Wins Big Job” Spokesman Review: April 30, 1955. “Bank to Double Size of Branch” Spokesman Review: July 2, 1954. “Cheney Dedicates New $163,000 City Light Building at Civic Fete” Spokesman Review: Oct 21, 1951. “$86,000 Bequest Gives Wilbur New City Hall” Spokesman Review: September 7, 1956. “Borah School Attracts 750” Spokesman Review: May 17, 1952. “School Addition Ready By Dec 1” Spokesman Review: October 4, 1948. “Connecticut Farmhouse Is Type of This New Fine Residence” Spokesman Review: December 21, 1940. “School Design In City Lauded” Spokesman Review: November 25, 1951. “North Side Business Adds to Store and Factory” Spokesman Review: July 14, 1945 . “Madison School Dedicated” Spokesman Review: March 22, 1950. “Unanimous Vote Supports 10-Story Parking Facility” Spokesman Review: June 6, 1972. “Harvey Home Designed for Best Use of Interior Space” Spokane Daily Chronicle: May 27, 1940. “Architect to Speak” Spokane Daily Chronicle: December 17, 1957. “”Monoxide Pits” Urged For Code” Spokane Daily Chronicle: June 13, 1936. “Library Board to Open Bids” Spokane Daily Chronicle: December 19, 1961. “The owner of an odd-shaped lot..” Spokane Daily Chronicle: January 18, 1950. “Grant Company Schedules Bids On Store Here” Spokane Daily Chronicle: April 4, 1953. “Building Of Bank To Begin Monday” Spokane Daily Chronicle: July 30, 1949. “Reardan Electors to Meet on School” Spokane Daily Chronicle: February 14, 1951. “Moscow School To Open Monday” Spokane Daily Chronicle: November 20, 1952. “Lake City Calls For School Bids” Spokane Daily Chronicle: November 15, 1950. “Bair Firm Awarded Cheney Building Bid” Spokane Daily Chronicle: August16, 1950. “11 4-H Members Go To Portland” Spokane Daily Chronicle: October 4, 1951. “Big Home Planned” Spokane Daily Chronicle: November 19, 1940. “Architect Builds Model Dwelling” Spokane Daily Chronicle: August 19, 1936. “Architects Vision No Vast Changes” Spokane Daily Chronicle: February 26, 1945. “School Project” Spokane Daily Chronicle: January 1, 1948. “Agrees to Deal With Custodians” Spokane Daily Chronicle: December 12, 1946. “Improvement District Talks Draw Crowd” Spokane Daily Chronicle: September 25, 1968.